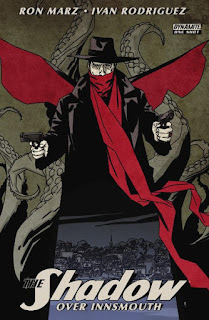 The Shadow and Margo Lane battle what appear to be Deep Ones in Innsmouth. The “Deep Ones” turn out to be bootleggers disguised as the creatures spoken of in the legends of the area. A surviving bootlegger refers to a Shadow, inspiring H.P. 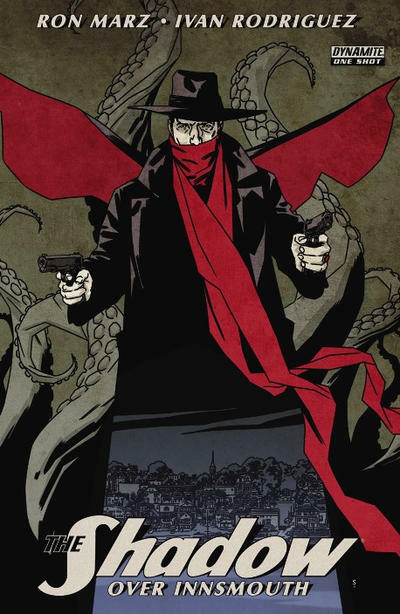 Lovecraft to write “The Shadow over Innsmouth.” The implication that Lovecraft’s story is fictional, and based on legends rather than actual events, places this story in an AU. I found the Scooby Do plot twist of the Deep Ones being bootleggers a let down. It would have been so much more interesting for the Shadow to battle Real Deep Ones. If this had been a Doc Savage crossover the revelation might have made a bit more sense. I (and a couple other people I've talked to who read it) feel exactly the same way. If I remember correctly, Barry Reese of the Shadow Fan Podcast like it, but he's the only one I've heard. I don't think he was really that ecstatic about it, just that it was okay. Not everything, but a lot of them do. However, most of it seems to be in AUs. Some of it has to be like Bill Willingham's Legenderry series which is set in a Steampunk work. Some of I imagine is open to debate like Garth Ennis run on the Shadow which could go either way.